When we left Trenton this morning, the sun was shining. There were a few scary clouds in the sky promising rain later in the day. There was a Hercules airplane flying overhead. It was going in circles and occasionally coming rather low. When we were close to the base it felt like it was doing a low altitude flyby to check out our bikes! I suspect they were doing some kind of pilot training, practicing touch downs and take offs. 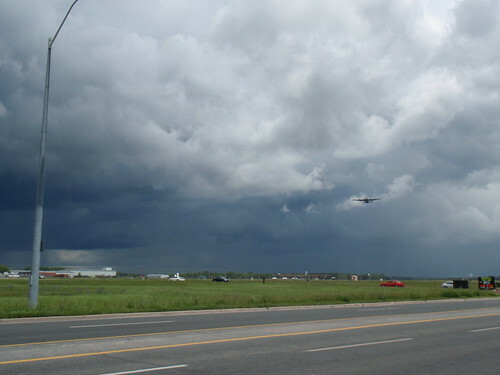 Plane flying over Trenton and some scary clouds. 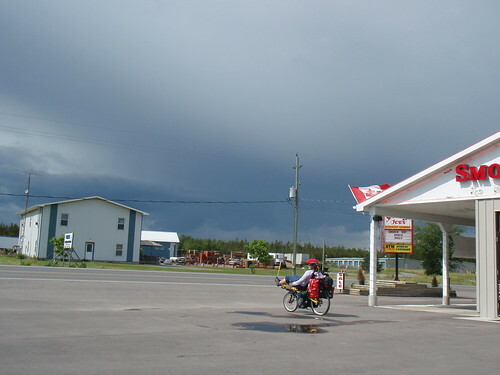 The ride time today wasn’t long and the route not very exciting (chosen for its directness not the scenery), but by the time we pulled into Napanee I was definitely ready to not be on my bike. It was disappointing because the road was mostly flat or slightly downhill. I was strong when we started out this morning, so it would have been an excellent day. Unfortunately, with effectively one gear, I tire quickly. I am forced to power up hills, often leaving Scott behind. This may seem good, but it puts a lot of strain on the knees and quads, so I must be extra careful not to injure myself. To add to the pain of the day, the weather didn’t cooperate. It rained a couple of times, such that we were happy to have decent rain gear. The biggest challenge with riding in the rain is keeping cool. Our raingear keeps us dry (mostly) but then also keeps us warm, which isn’t really necessary when it is 18 deg outside. The temperature was just wrong, such that if you didn’t have wet weather gear, you got too cold, but with it you cooked. Adding insult to injury, after about 30 km, we discovered that I had lost a screw for my cleat. This means that I can’t safely “click-in” to my pedal. Fortunately I have pedals that have one side flat, so I can use them without cleats. This makes me slightly less effecient uphills. It is just good that todays ride didn’t involve many hills! All that being said, I’m actually have a good time. We stopped at the second hotel we passed. It was cheap, has Internet, and we have a covered patio where we could cook dinner. It turns out the nearest bicycle shop is only about 500 m (if that) away. There is some hope that they will have a screw for my cleat :). Scott is disassembling the shifter this evening, so see if he can figure out what is wrong. We are looking into requesting that we get replacement “stock” Roloff shifters. Tomorrow we plan to ride 40 km into Kingston. From there, one of us will take a bus or train home to pick up the car and bike rack and return to Kingston. Becky thought the road was flat or downhill, but I think that’s because she’s getting stronger. I looked on toporoute.com and we ended the day slightly above where we started, with a number of hills in between. I’m using Toporoute for this because I don’t trust my GPS altimeter in weather like we had today, since it measures altitude using barometric pressure. When we stopped for lunch, the altimeter read -40m, and changed to +60m while we were eating. Given the nasty weather, I’m not surprised by the shift in barometric pressure, but it does seem to play havoc with the GPS measurements. Charts from the GPS, including an insane elevation chart due to barometric pressure swings and a speed chart which isn’t quite right either – courtesy of dead batteries just before we stopped. This entry was posted on Wednesday, June 18th, 2008 at 8:24 pm	and is filed under Journal. You can follow any responses to this entry through the RSS 2.0 feed. You can leave a response, or trackback from your own site. I actually happen to have a spare standard replacement Rohloff shifter. I bought it intending to replace the worn one on my trike (in addition to being worn, it has had a stripped Torx screw for several years now making cable replacements a bit more difficult than normal). If you can arrange to have a replacement sent to me, you are welcome to the one I have to avoid any timing problems with your schedule. When we sailed past Trenton last summer there was a Hercules plane circling. Hope it wasn’t the same one — talk about a holding pattern. Anyway, glad to hear you’re out of yours and on the road again. If you find a solution to the problem of temperature regulation in rain gear, *please* let me know. I was riding today in the same conditions as you describe and was sweltering (but quite dry, thank you) in my windbreaker. I’m glad to read that you’re still plugging along, even with the shifter problems! When I rode through this area on my Ottawa to Hamilton tour (http://vic.gedris.org/pics/2003-07-07/) I also noticed the airplanes circling around Trenton. I took a different route through here though. I rode down through Picton and Aldolphustown. Some great scenery in that area….plus a fun (free) ferry ride, the Bloomfield Bicycle Company, and a nice campgroud at Adolphustown. Unfortunately, the original planned route through Picton would have added about 50 km, a bit much without gears. Fortunately, we have spent a couple of long weekends cycling around Prince Edward county a couple of years ago, so we are familiar with the area. That meant that we really didn’t feel like we were missing much. That being said, I would not recommend the ride from Trenton to Napanee on the 2. It has too much traffic and not enough shoulder.